Figure 2. (A) Composite drawing of micromomyid plesiadapiform skull and skeleton (UM 41870) with numbers on bones corresponding to those of anatomical layout. Scale = 1 cm. Figure 2. Continued (B) Skeleton of micromomyid (UM 41870) laid out in anatomical position with bones attributed to regions based on positional information. Scale = 3 cm. Note that Figure 2B was made before all of the bones were prepared from the rock. 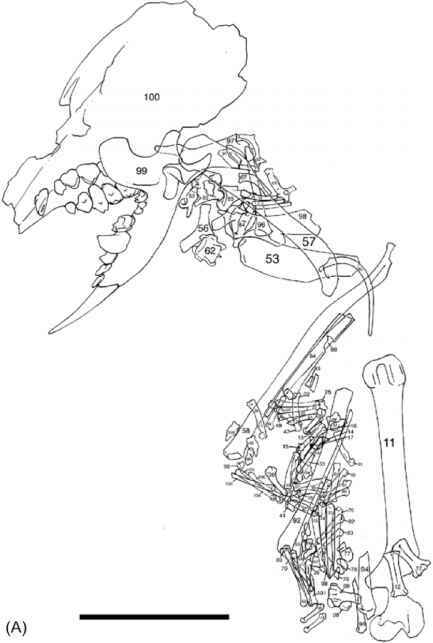 As such, not all bones depicted in Figure 2A are laid out in Figure 2B. 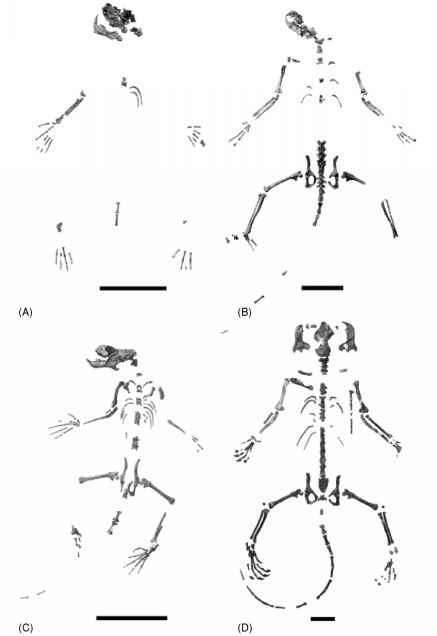 Furthermore, a few bones attributed to the skeleton are not depicted in either A or B (see Figure 7). Figure 3. Skeletons representing three plesiadapiform families were recovered from Late Paleocene limestones. Paromomyidae is represented by (A) Acidowwmys hebeticus (UM 108207) and (B) Ignacius cf. I. graybullianus (UM 108210 and UM 82606). Carpolestidae is represented by (C) Carpolestes impsoni (UM 101963; figure from Bloch and Boyer, 2002a, Figure 2A). Plesiadapidae is represented by (D) Plesiadapis cookei (UM 87990). Scales = 5 cm. characteristics that are indicative of arboreality. Specifically, plesiadapiforms are inferred to have been capable of clinging and claw climbing on large diameter vertical tree trunks, as well as grasping smaller branches with their hands and feet (Godinot and Beard, 1991; Sargis, 2001a, 2002b,c,d; Szalay and Dagosto, 1988; Szalay et al., 1975, 1987). Callitrichine primates (Bloch and Boyer, 2002a,b; Bloch et al., 2001; Boyer and Bloch, 2002b; Boyer et al., 2001), arboreal pha-langerids (Bloch and Boyer, 2002a), and ptilocercine tree shrews (Sargis, 2001a,b, 2002a,b,c,d) have all been cited as close structural analogues to plesiadapiforms. We draw primarily on studies of behavior [Garber, 1992; Kinzey et al., 1975; Sargis, 2001a (see references therein); Sussman and Kinzey, 1984 (see references therein); Youlatos, 1999] and in some cases on understandings of form-function relationships in extant taxa (Godinot and Beard, 1991; Hamrick, 1998, 2001; Sargis, 2001a,b, 2002a,b) to interpret the functional significance of the features shared by all plesiadapiforms that we have studied. 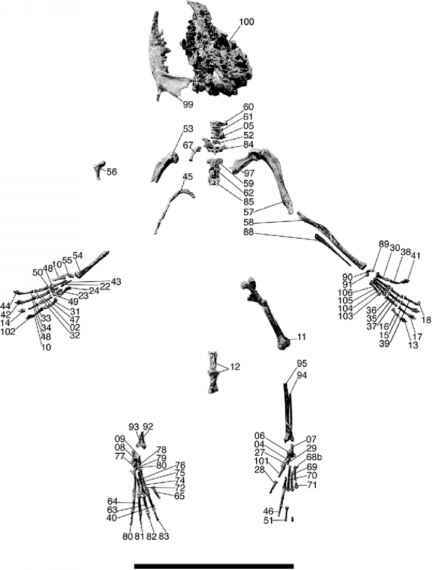 Morphological correlates of vertical clinging and climbing are numerous and easily observed in the appendicular skeleton, as this region is relatively frequently preserved in fossil taxa and thus has been the focus of many studies. Conversely, the vertebral column of plesiadapiforms has received little attention due to the scarce occurrence of skeletons with associated material from this region. However, plesiadapiform vertebral columns are both diagnosably distinctive in their morphology and functionally informative. Distinctive features include: (1) vertebral bodies that increase markedly in size from the cranial to caudal end of the trunk, (2) vertebral bodies of the cervical and lumbar vertebrae that are dorsoventrally shallower than mediolaterally broad, (3) spinous process of the axis caudally oriented, (4) spinous processes of postdiaphragmatic thoracic and lumbar vertebrae cranially oriented, (5) transverse processes of the lumbar vertebrae arise from the pedicle where it contacts the body, (6) postzygapophyses of the postdiaphragmatic thoracic and lumbar vertebrae mediolaterally broadly-spaced, with facets that are craniocaudally short, have a rectangular (rather than elliptical) margin, and face ventrolaterally, (7) a sacrum that has three vertebrae and in which the long axis of the auricular facet is oriented craniocaudally, and (8) a tail that is relatively long. While the vertebral column varies in functionally significant ways among taxa, our preliminary study suggests that the center of gravity of the plesi-adapiform neck and trunk vertebrae was not midway between the pectoral and pelvic girdles as in suspensory taxa and terrestrial cursors, but was cau-dally shifted, and had more sagittal than lateral flexibility. Morphology of the vertebral column, viewed as an integrated unit, indicates that plesiadapiforms were capable of bound-galloping in which the brunt of the weight is born on the hindlimbs and flexion and extension of the back contributes to the stride (Gambaryan, 1974). Furthermore, features shared with vertically clinging cal-litrichine primates (e.g., widely spaced postzygapophyses of lumbar vertebrae that face ventrolaterally), also suggest orthograde postures in plesiadapiforms. Other plesiadapiform traits that suggest claw climbing on large diameter supports are found mainly in the appendicular skeleton. Many previous studies document and discuss the functional significance of the limb elements in plesiadapiforms (Beard, 1989, 1990, 1991a, 1993a,b; Godinot and Beard, 1991; Sargis, 2002b; Szalay and Dagosto, 1980, 1988; Szalay et al., 1975, 1987). The humerus of plesiadapiforms indicates a mobile forelimb with capabilities for powerful and sustained extension and flexion at the shoulder and elbow joints respectively, as required in vertical clinging postures (Szalay and Dagosto, 1980). The humeral head is spherical and extends superiorly beyond the greater and lesser tuberosities, allowing mobility at the glenohumeral joint (Sargis, 2002a, and references therein) and possibly some stability by providing more room for attachment of the rotator cuff muscles on these tuberosities (Fleagle and Simons, 1982; Grand, 1968; Harrison, 1989). The lesser tuberosity flares medially providing a large insertion site for the subscapularis muscle that extends, adducts, and medially rotates the humerus, making it important during vertical clinging postures and the support phase of vertical climbing (Beard, 1989; Larson, 1993; Sargis, 2002a). The distal humerus has a posterolaterally flaring supinator crest, indicating that plesiadapiforms had a high degree of powerful flexion at the elbow (Dagosto et al., 1999; Gregory, 1920; Szalay and Dagosto, 1980). Presence of a shallow olecranon fossa on the humerus suggests limited extension of the forearm. An extended entepicondyle of the humerus would have provided room for origination of strong flexor muscles of the wrist and fingers, such as flexor carpi radialis and flexor digito-rum superficialis muscles (Sargis, 2002a). The capitulum and ulnar trochlea are separated by a deep zona conoidea indicating that the radius and ulna were not highly integrated in their functions (Sargis, 2002a). Instead, the spherical to slightly elliptical capitulum allowed the radius to rotate freely about the ulna (Sargis, 2002a; Szalay and Dagosto, 1980). Therefore, in many regards, the humerus suggests locomotion in an arboreal setting on large diameter supports. The ulna of plesiadapiforms has a shallow trochlear notch and long, anteriorly inflected olecranon process, indicating habitual flexion as would be used in orthograde clinging and pronograde bounding (Rose, 1987). A flat to slightly convex proximal articulation with the radius is consistent with independent function of that element in axial rotation. The shaft is medially bowed in cross-section, such that a strong lateral groove, which begins proximally as a deep fossa on the olecranon process, runs along the length of at least its proximal two-thirds. Such a groove expands the area for the origin of extensor muscles of the fingers. The shaft is typically slender without marked expression of an interosseous crest. The proximal radius of plesiadapiforms typically has a spherical fossa and broad lateral lip that matches the spherical capitulum of the humerus (Beard, 1993a), allowing for a large degree of axial mobility (MacLeod and Rose, 1993; Sargis, 2002a; Szalay and Dagosto, 1980). The bicipital tuberosity of the radius is large and proximally located, indicating the presence of a strong biceps brachii muscle. The shaft of the radius is generally mediolaterally wide and flattens distally in its dorsopalmar aspect. Medial and lateral longitudinal ridges for the deep digital flexor muscles often mark the palmar aspect of the radial shaft. The distal end of the radius supports most of the carpus while the ulna is typically reduced. Because the wrist joint in plesiadapiforms is almost entirely formed by the radius, rotation of this element about the ulna does not compromise stability of the wrist. The distal articular surface of the radius is canted palmarly indicating habitual palmar-flexion of the proximal carpal row. Though the hand is specialized differently in the four plesiadapiform families considered here, there are several features that are shared and suggest similar functions in an arboreal environment. A divergent pollical metacarpal in all plesiadapiforms indicates that they were capable of effective grasping of small diameter supports. Long proximal phalanges relative to the metacarpals (=prehensile proportions; Bloch and Boyer 2002a; Hamrick, 2001; Lemelin and Grafton, 1998) in non-plesiadapid plesiadapiforms also indicate specialized grasping abilities. The proximal phalanges of all plesiadapiforms have strong ridges for annular ligaments that prevent bowstringing of tendons of the flexor digitorum profundus and superficialis muscles during strong grasping in which the intermediate-proximal phalangeal joint is flexed at a highly acute angle. The distal articular surface of the proximal phalanx is not smooth, but has raised medial and lateral margins that create a broad, central groove into which the grooved proximal articular surface of the intermediate phalanx fits tightly (see description in Godinot and Beard, 1991: 311). Such a grooved surface prevents torsion and mediolateral deviation at this joint. The distal phalanx of plesiadapiforms, like that of Ptilocercus and other arboreal mammals, is dorsopalmarly deep and mediolaterally narrow providing better resistance against sagittal bending loads incurred during vertical claw clinging and climbing (Beard, 1989; Hamrick et al., 1999; Sargis, 2002a). The distal phalanx is usually characterized by an articular surface that is ventrally canted, indicating habitual palmar-flexion during clinging. It also has a large flexor tubercle that supported a robust tendon for a powerful flexor digitorum profundus muscle, allowing frequent and sustained use of such claw-clinging postures. While the innominate of plesiadapiforms varies in functionally significant respects among the taxa considered here, all seem to share characteristics that reflect functions and postures associated with vertical clinging behaviors (Beard, 1991a). In contrast to the acetabulum of cursorial animals and more terrestrial scansorialists (e.g., tupaiine tree shrews), plesiadapiforms have a more elliptical acetabulum, the major axis of which is craniocaudally oriented (e.g., Silcox et al., 2005, Figure 9.5A). This indicates a limited range of sagittal flexion and extension during which the joint surfaces of the femur and acetabulum fit tightly together, and maintain maximal stability. Such morphology suggests a joint that has a large range of stable adduction and abduction (Beard, 1991a). When the femur is articulated with the acetabulum the joint surfaces conform most closely, (fovea capitis femoris aligned with the center of the acetabular fossa), when the femur is flexed and the shaft is abducted by about 45° from the sagittal plane. We infer that this orientation of the femur relative to the innominate represents a component of habitual posture. The acetabulum is cranially buttressed and its axis is dorsally rotated in plesiadapiforms, indicating that this joint was probably subject to caudally directed forces experienced during orthograde postures (Beard, 1991a). The ilium is generally slender and triangular in cross section, much the same as in extant Ptilocercus (Sargis, 2002b,c). This is in contrast to the condition in euprimates (including extant callitrichines), which are characterized by a hugely expanded dorsolateral face of the ilium, reflecting the origination of hypertro-phied gluteal muscles for powerfully extending the femur during leaping or quadrupedal bounding (see Anemone, 1993; Sargis, 2002b; Taylor, 1976). 1993) and a proximally extended groove that allows the patella to shift high on the thigh during extreme contraction of the quadriceps muscles. In contrast, the patellar groove of plesiadapiforms is shallow, not raised anteriorly above the level of the anterior surface of the shaft, and not extended proximally on the shaft. 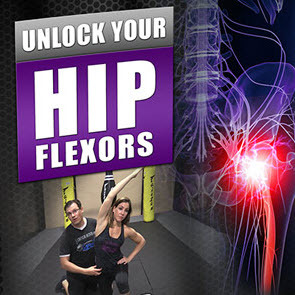 This form suggests infrequent forceful full-extension of the knee. Notably, the patellar grooves of both Ptilocercus and marmosets are nearly identical to those of plesiadapiforms in these respects (Sargis, 2002b,c). Posteriorly, the distal intercondylar area is angled ~10° lateral to the shaft, suggesting that the tibia would have rotated laterally, contributing to pedal inversion, during extension of the knee. Medial and lateral margins of the condyles slope away from each other proximally at an angle of ~45°. This results in the posteroproximal part of the condyles being broader and more robust, again indicating that flexion was the habitual posture with loads being sustained on extended limbs only infrequently. The lateral condyle is generally ~50% wider than the medial condyle. The morphology of the proximal tibia of plesiadapiforms reflects similar positional behaviors as that of the distal femur. The proximal tibia is antero-posteriorly compressed, unlike that of leapers and runners such as tupaiines (Sargis, 2002b), lagomorphs, tarsiers, and felids. The medial facet is usually smaller than the lateral facet, concave, oriented somewhat posteriorly and sunk below the level of the lateral facet, which is flat to convex and extends higher proximally. Both facets face slightly laterally, rotating the tibial shaft out of the plane of flexion with the knee. The proximal half of the shaft is compressed mediolaterally and triangular in cross section. The posterior and lateral surfaces of the proximal shaft of the tibia are concave in cross section, providing ample room for strong pedal plantar-flexors (soleus and tibialis posterior), and digital flexors (flexor digitorum tibialis), respectively. The distal part of the shaft of the tibia is strongly bowed both in the medial and anterior directions. This makes the foot of plesiadapiforms permanently somewhat inverted when flexed. The medial malleolus on the distal tibia is weaker and more distally restricted than that of other arboreal placentals such as Ptilocercus and primitive euprimates. The astragalar facet on the distal tibia is ungrooved, square, angled somewhat posterolaterally, and forms an obtuse angle with its extension on the medial malleolus. With regard to all of these features, the distal tibia of plesiadapiforms is most comparable to that of phalangerid marsupials (e.g., Petaurus and Trichosurus) in which the distal tibia and fibula have a flexible articulation with each other and the tarsals, allowing for a greater degree of mobility between the tibia and astragalus (the upper ankle joint = UAJ) than is typical for placentals. Among plesiadapiforms, the proximal articulation of the tibia and fibula is only known in paromomyids and micromomyids. It is transversely oriented and may have been synovial. The distal articulation is known in all four groups discussed here and, except in carpolestids (see the section on Carpolestidae below), appears to have been a flexible syndesmosis (Beard, 1989, 1991a). There are grooves on the posterior surface of the tibia and fibula. On the posterior tibia, such grooves mark the course of the tendons of the tibialis posterior, flexor fibularis, and flexor digitorum tibialis muscles, while on the posterior fibula they mark the course of the tendon of the peroneus brevis muscle. These muscles would have served to resist mediolateral forces at the UAJ, thereby compensating for the stability given up for mobility between joint surfaces, and facilitate inversion and eversion at the lower ankle joint, as they do in arboreal marsupials and some rodents (Gunnell, 1989; Jenkins and McClearn, 1984). The astragalus, calcaneum, and cuboid of plesiadapiforms have been discussed extensively in terms of their diagnostic and functional features (Beard, 1989, 1993b; Dagosto, 1983; Decker and Szalay, 1974; Gebo, 1988; Gunnell, 1989; Szalay and Decker, 1974; Szalay and Drawhorn, 1980). Plesiadapiforms are limited in the degree of plantar-flexion that can be accomplished at the UAJ by the small arc formed by the tibial facet of the astragalus. A slight amount of pedal inversion, limited by malleoli bracketing the astragalus, results from plantar-flexion at the UAJ (Beard, 1989). The lower ankle joint is axially mobile, the calcaneum being capable of rotating medially and shifting distally to invert the foot (Szalay and Decker, 1974). At the transverse tarsal joint, such rotation is not limited by the calcaneo-cuboid articulation, which is transverse (Beard, 1989; Jenkins and McClearn, 1984). On the cuboid, the orientation of the groove for the tendon of the peroneus longus muscle is transverse, facilitating eversion by this muscle. Because the distal tarsal rows have rarely been preserved in association, little has been said about them. However, new specimens of micromomyids, paromomyids, and plesiadapids—all show a similar configuration in which the tarsometatarsal articulation faces slightly laterally, causing the foot to be abducted relative to the upper ankle, when dorsiflexed. The mesocuneiform is shorter than the entocuneiform and ectocuneiform such that metatarsal II articulates out of plane with the rest of the metatarsals and is dove-tailed within the distal tarsal row, creating a rigid tarsometatarsal articulation. The entocuneiform and first metatarsal have been discussed extensively for plesiadapids and paromomyids (Beard 1989, 1993a; Sargis, 2002b,c,d; Szalay and Dagosto, 1988). These elements are nearly identical among the plesi-adapiforms considered here with the exception of those in carpolestids. In plesiadapids, paromomyids, and micromomyids the robust plantar process on the entocuneiform reflects frequent pedal inversion and possibly the presence of powerful pedal and digital flexors (contra Beard, 1993a; but see Sargis, 2002b; Szalay and Dagosto 1988). The hallux is strikingly similar to that of Ptilocercus in that the articulation for the hallucal metatarsal on the entocuneiform is dorsally broad and saddle-shaped (Sargis, 2002b,c,d; Szalay and Dagosto, 1988), and the hallucal metatarsal is robust, divergent from the other metatarsals, exhibits slight torsion of the distal end, and has peroneal and medial processes that are reduced such that the entocuneiform joint is open and mobile. These features indicate that the hallux was used in grasping (Sargis, 2002b,c,d; Szalay and Dagosto, 1988), as convincingly demonstrated for that of Ptilocercus through behavioral observations (Gould, 1978; Sargis, 2001a and references therein) as well as by myological and osteological studies (e.g., Gregory, 1913, Le Gros Clark, 1926, 1927; Sargis 2002b,c; Szalay and Dagosto, 1988). The hallux seems to have been used primarily as a load-bearing "hook" while the rest of the foot served as a lateral brace during locomotion on subhorizontal supports with relatively small diameters (Sargis, 2002b). Sargis (2001a) considered such grasping to potentially represent the antecedent condition to the powerful grasping of euprimates, as well as the primitive condition in the ancestral archontan or euarchontan (see also Sargis, 2002b,c,d; Szalay and Dagosto, 1988). Except in carpolestids, the metatarsal/phalangeal proportions of plesiadapi-form feet are not as extreme as those of the hands (i.e., the feet do not exhibit prehensile proportions), thus, the feet have proportions unlike those in the feet of specialized slow-moving graspers, and more like those of generalized arbo-realists that use a bounding gait. This is because the metatarsals are generally relatively long. The long metatarsals that rigidly articulate with the tarsals of plesiadapiforms are similar to those of callitrichine primates, Ptilocercus, and many other arboreal and scansorial mammals. These features are indicative of a bounding gait, similar to that usually used on horizontal substrates most frequently by more terrestrial scansorialists such as tupaiine tree shrews (Jenkins, 1974; Sargis, 2002b) and sciurid rodents. Long metatarsals increase the distance that can be covered with each "bound." The toes are longer than the fingers and thus may have been relied on to support the body weight in clinging and hanging positions more frequently than the fingers. Overall, the morphology of the appendicular skeleton of plesiadapiforms indicates a mobile forelimb capable of strong flexion at the shoulder and elbow joints that helped keep the body close to the substrate during vertical postures and that assisted the hindlimbs in scrambling up a vertical substrate. The hands could be supinated and pronated freely and were effective at grasping, allowing these animals to move easily through broken substrates on smaller supports. The hindlimbs indicate habitual flexion with a broad foot stance, consistent with habitual use of large diameter supports. Furthermore, the plane of flexion of the hindlimbs is not sagittal, as in terrestrial bounders and runners, but is rotated significantly laterally. Thus, instead of pushing away from a vertical substrate during upward propulsion, the hindlimbs extended more parallel to the substrate. The ankle exhibits axial flexibility and the capability to invert the foot. Such mobility would have allowed the substrate to be grasped from a plantar-flexed position, thereby facilitating headfirst descent of tree trunks, as well as moving on small horizontal branches. Although the feet are generally not as committed to grasping as the hands, they too would have been effective on small supports and discontinuous substrates owing to a somewhat divergent, prehensile hallux, like that of Ptilocercus and callitrichines.